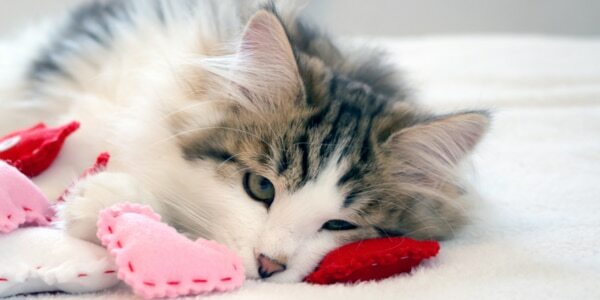 We’ve got you covered with a beautiful message to share with your one true love (your cat). Share this poem with kitty to create a moment to remember. To make the experience even more special, we recommend performing your recitation while handing over a tasty treat. I love your precious little nose. The way you lick between your toes. And play with toys until they break. I know it’s simply useless. I cannot resist your cuteness. When you stand on your hind feet. I love every single tiny claw. I’m wrapped around your little paw. If this doesn’t get you a friendly head bump or slow blink then it may be time to reassess the dynamics of your relationship. Ask yourself: are you doing enough for your cat? If the answer is no, we’ve got good news: it’s not too late to buy kitty’s love with our Valentine’s Day flash sale! I need to repair my relationship with my cat, take me to the sale! This entry was posted in Cat happiness, Cat health and wellbeing, Uncategorised. Bookmark the permalink.